Back acne differs from the usual breakouts you get on your face. The back acne can be more difficult to treat due to their inaccessible location. Back acne, or ‘bacne’, is also easily aggravated by irritation from tight shirts or sweat trapped under clothing. If you want to diminish the appearance of back acne and achieve smoother, healthier looking skin, you need the right treatments to address the problem. Acne peels are the best way to treat existing acne and acne scars that develop after episodes of severe breakouts. At the Cutis Laser Clinics in Singapore, we offer several peels designed to treat back acne, including the Cutis Anti-Acne Peel and the Vi Peel. Chemical peels have been used throughout the world for centuries to help people achieve more beautiful skin. These peels work by removing the outer superficial layer of skin to reveal healthier skin underneath. Chemical peels like the Cutis Anti-Acne Peel also stimulate collagen production and cell growth regeneration to achieve smoother skin. The Cutis Anti-Acne Peel in particular is effective at treating certain types of acne and reducing the appearance of deep acne scars and other skin issues. The Cutis Anti-Acne Peel solution is derived from the willow plant, which has been proven effective in penetrating the skin to clear out pores. In addition to unclogging pores, the acne treatment kills acne-causing bacteria on the skin. The unique formula contains active ingredients such as salicylic, kojic, alpha arbutin, licorice extract, and vitamin E to diminish active acne and rejuvenate damaged skin. 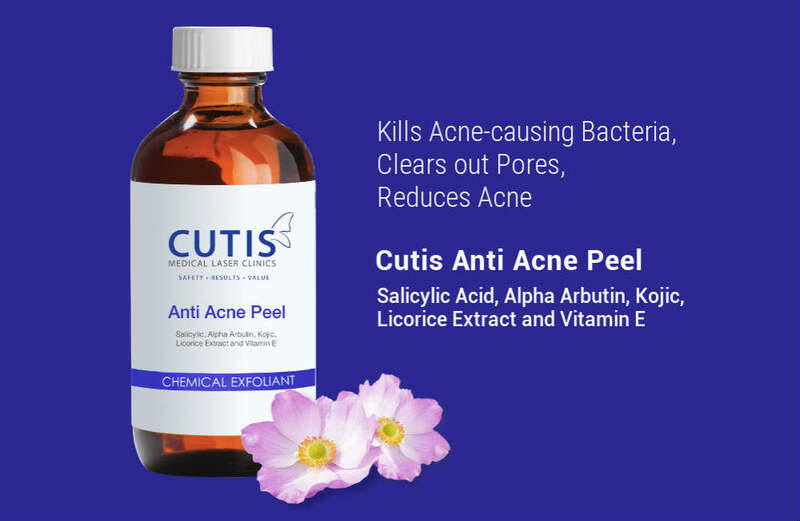 The Cutis Anti-Acne Peel is ideal for people with mild to moderate acne vulgaris. Chemical peels involve the controlled application of safe chemical solutions onto the skin to exfoliate the damaged top layer. The chemical solution cause the top layer of skin to peel which helps reduce superficial problems like age spots, discoloration, and acne. The Vi Peel is a unique acne scar treatment as it reaches deeper into the skin to reduce the appearance of severe scarring. It’s also specially formulated to improve the texture, tone, and clarity of the skin. The Vi Peel is virtually painless but provides dramatic results in just a few days of peeling. When you first undergo treatment, you may experience a tingling sensation on the skin which lasts for several seconds before subsiding. Following the application of the chemical peel solution, it’s normal to develop a temporary tan or reddish skin. The peeling process doesn’t begin for a day or two after the treatment and will likely continue for an additional three to four days. After your VI Peel treatment, avoid activities that induce excessive sweating for 72 hours after your peel, as sweating may induce water blisters and this can induce post inflammatory hyperpigmentation. One of the most common areas for acne breakouts is on the back. If you’re struggling with bacne, take advantage of the safety and effectiveness of chemical peel treatments. Learn more about the Cutis Anti-Acne Peel or the Vi Peel by contacting our experienced aesthetic doctor and skin specialist, Dr. Sylvia Ramirez, at the Cutis aesthetic clinic.